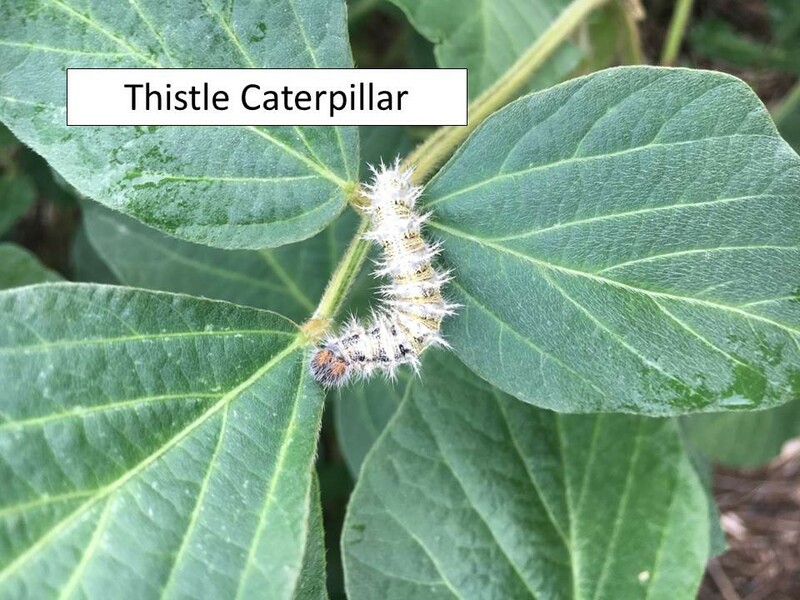 Soybean Update – Green Cloverworms, Thistle Caterpillars, Stink Bugs, Soybean Aphids, and Beneficials. Insect activity is still increasing around north central Kansas. One positive, bean leaf beetles seem to be at really low densities in most fields, at least so far. 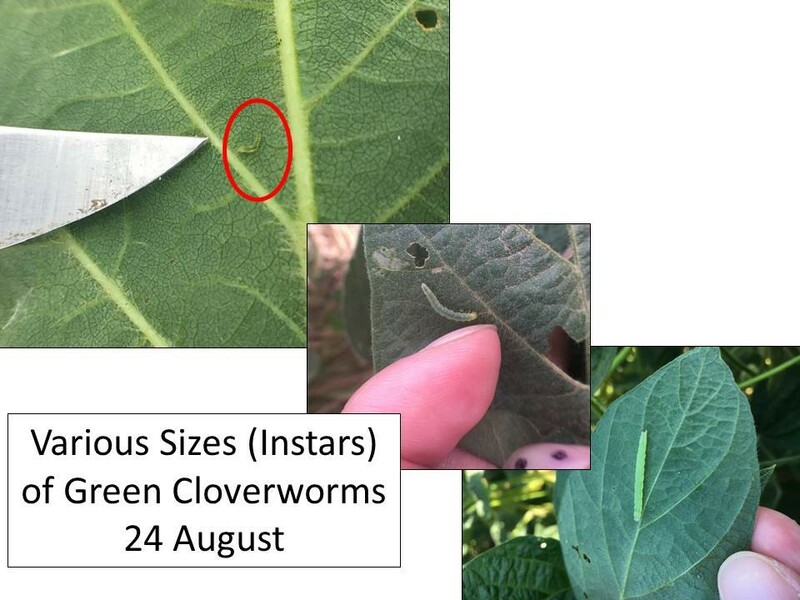 Green cloverworm larvae are at various developmental stages but there are still many early instars. This means there probably is considerable defoliation to come because, as the larvae get larger, they simply eat more leaf tissue. 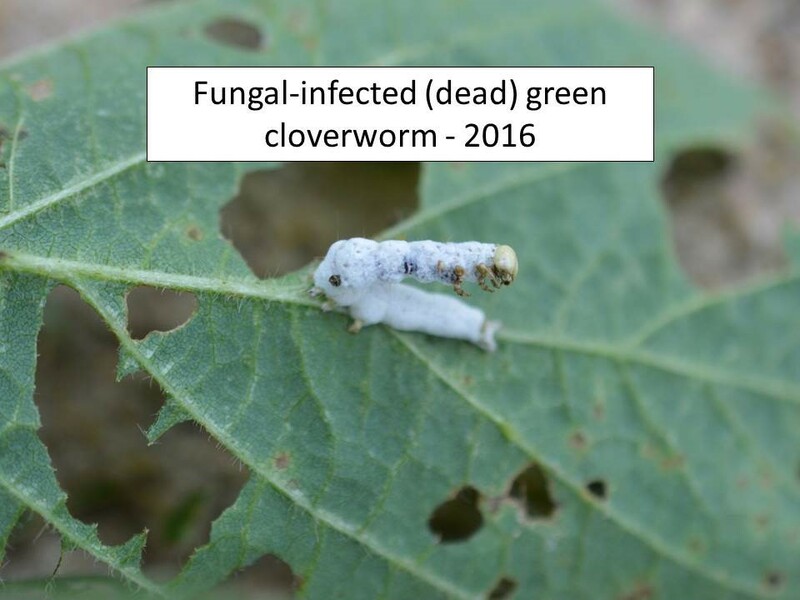 However, as green cloverworm populations increase, they are often infected with an entomophagous fungus which decimates their populations. There also are many areas with significant infestations of thistle caterpillars and garden webworms. 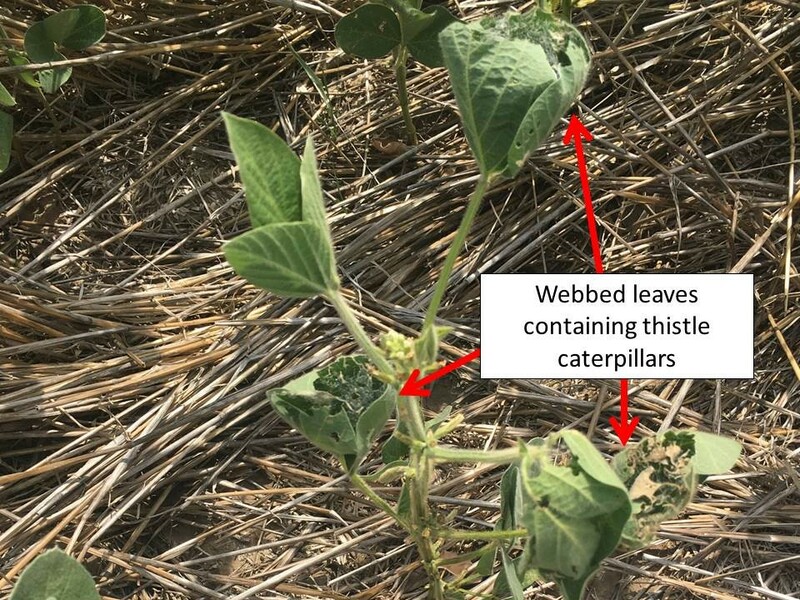 Both species web leaf tissue around and over themselves, creating a relatively secure area from which they feed on leaves. 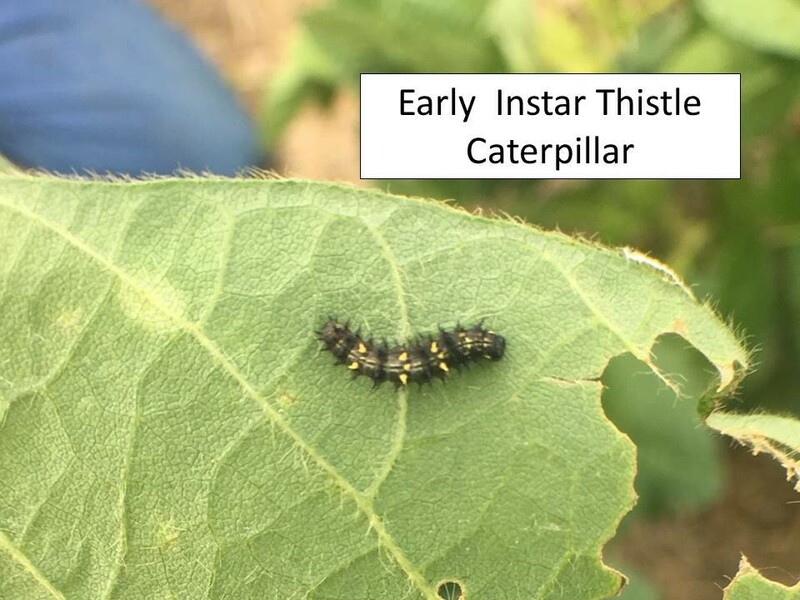 Many thistle caterpillars are really small right now and may not be noticed yet. So, continued monitoring is important, especially with soybeans just entering the reproductive stages of development. 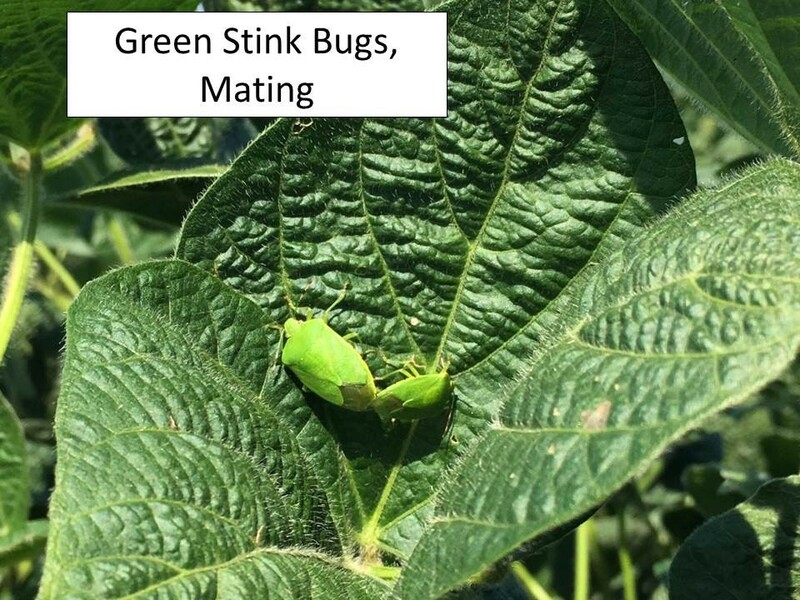 Green stink bugs are relatively common in both conventionally planted and double-cropped soybeans. There are eggs, nymphs, adults, and mating adults all present at this time so sampling needs to be conducted periodically as these bugs can feed on the beans while they are developing inside the pods. 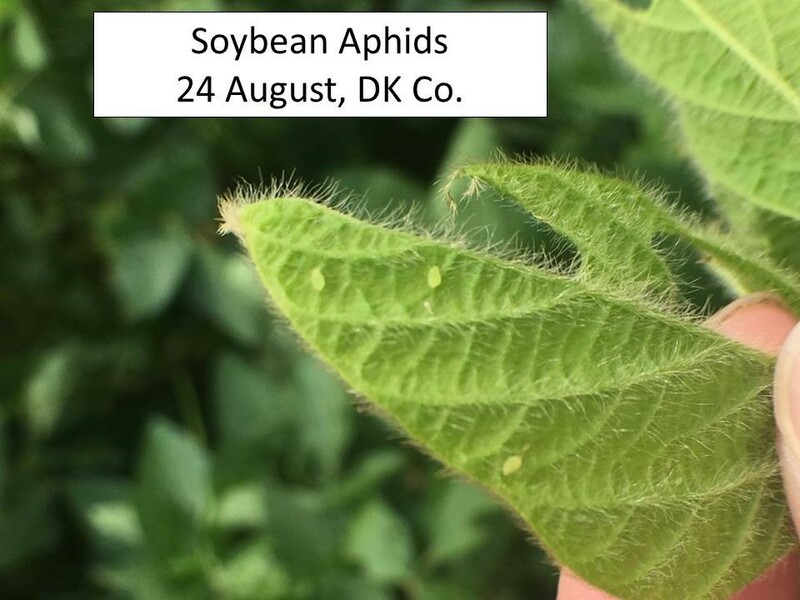 Soybean aphids were detected in double-cropped soybeans in Dickinson Co. on 24 August. 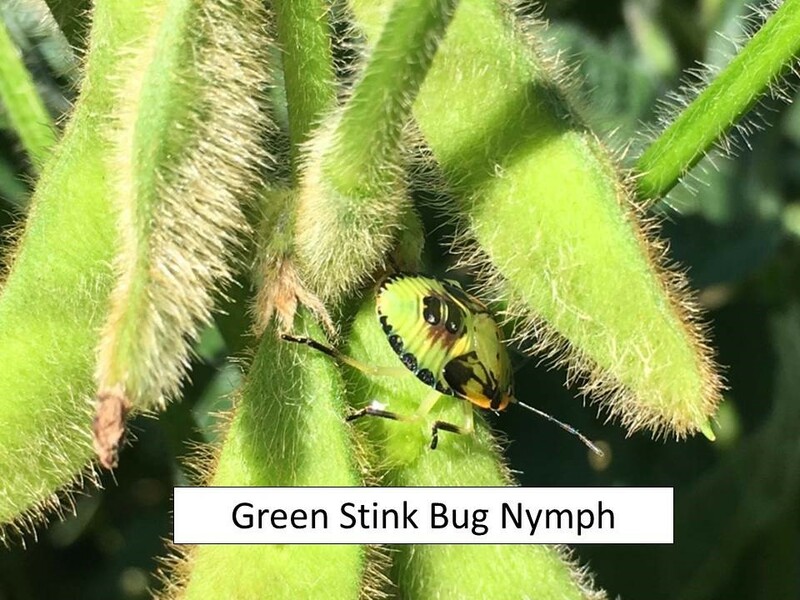 Many soybean fields have significant populations of green lacewings and lady beetles, both of which may help control soybean aphids if and when they migrate into these fields. So, as always, please take these into consideration if insecticide applications are contemplated. 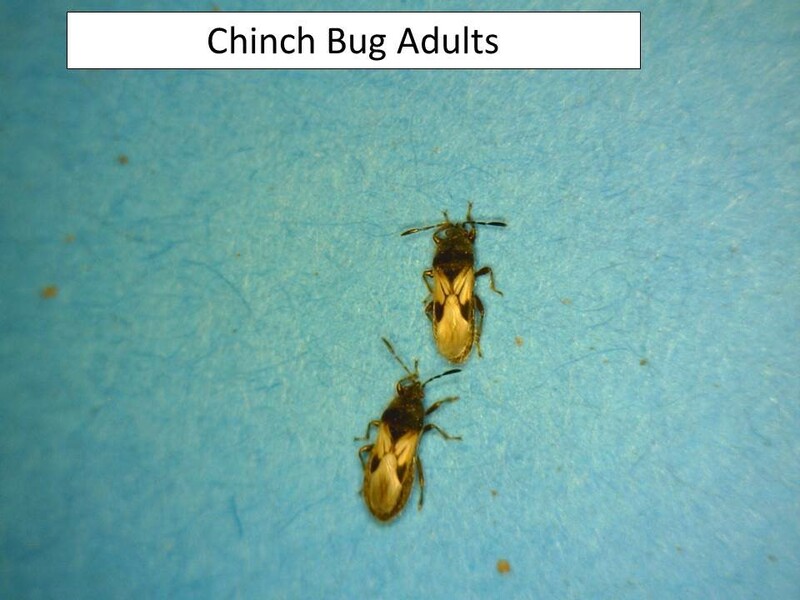 Chinch bugs continue to be very active in both corn and sorghum throughout north central Kansas. Both nymphs and adults are present. Many adults are still mating, which indicates that there are more eggs, nymphs, and adults yet to come. 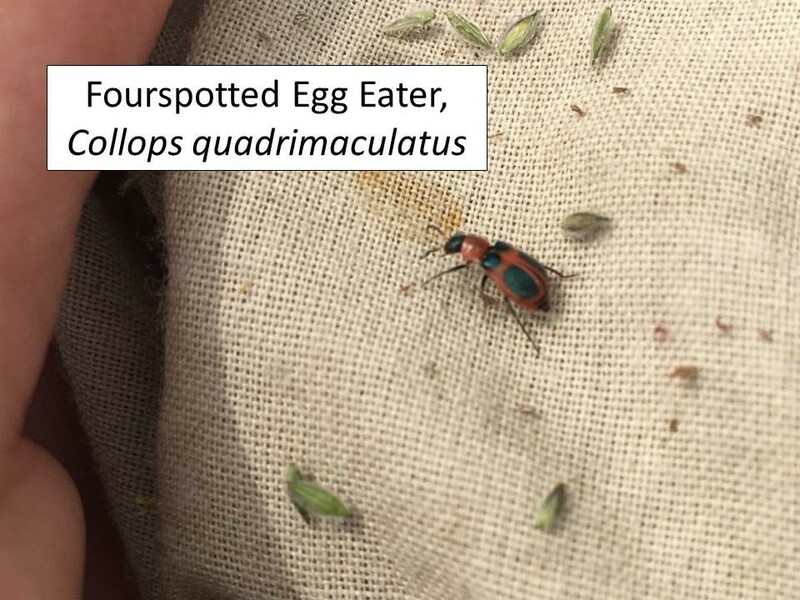 One consolation relative to the numerous chinch bugs in sorghum fields is that the four spotted egg eater, Collops quadrimaculatas, seems to be plentiful as well. They have been collected in samples while sweep sampling alfalfa and are also present in sorghum fields. These little beetles are predacious on insect eggs, and it has even been reported that they feed on chinch bug eggs. Not sure they will be able to provide a great deal of control on chinch bug populations but it sure can’t hurt! 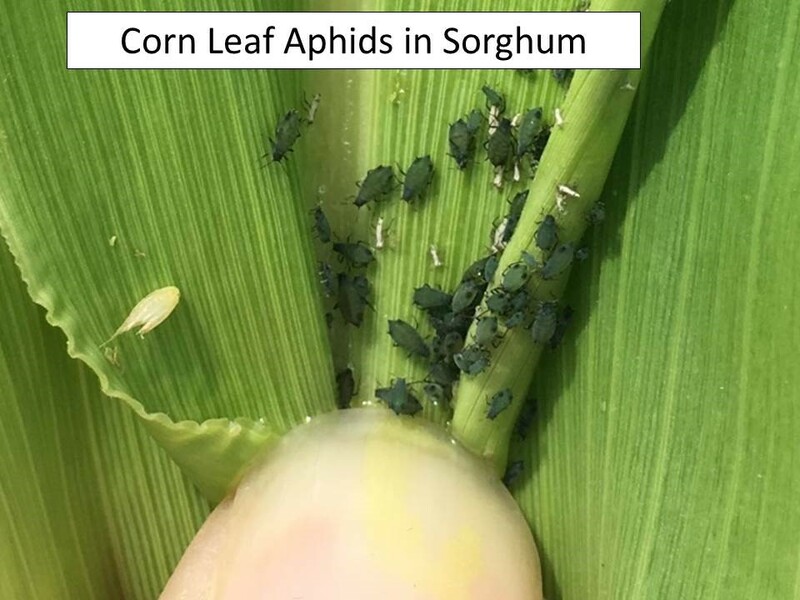 Corn leaf aphids are also very plentiful throughout north central Kansas. 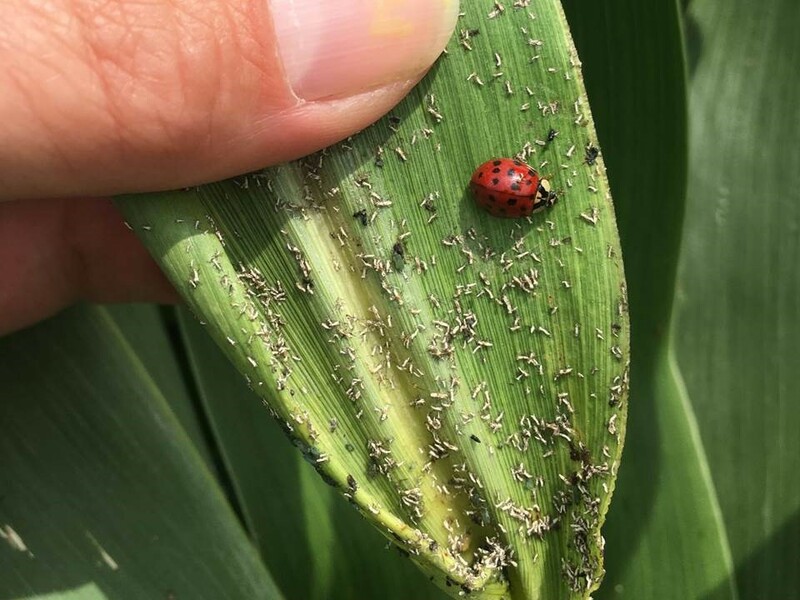 These aphids usually feed on developing corn tassels and silks, but probably are more commonly associated with, or at least noticed in, whorl stage sorghum. These aphid colonies sometimes produce enough honeydew, and it is so sticky, that often the sorghum head gets bound up in the whorl and therefore doesn’t extend up properly. These colonies are not usually dense enough on a field-wide basis to justify and insecticide application. 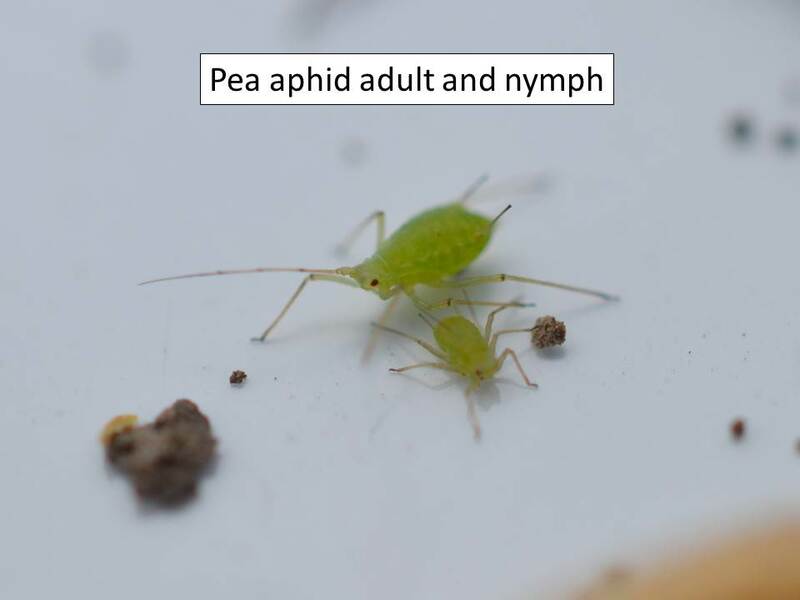 These plentiful aphids are also serving as a food source for many predators, i.e. lady beetles, green lacewings, etc. 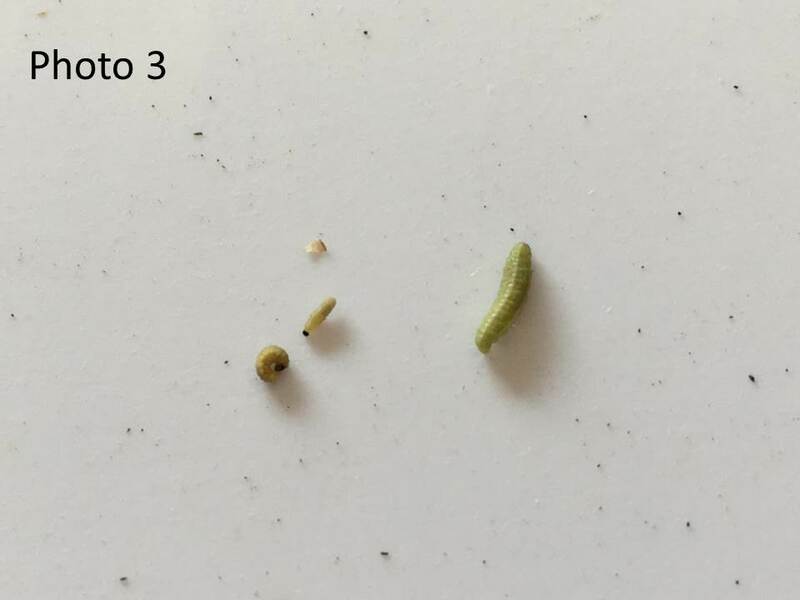 Corn earworms are still plentiful in corn but as they mature, pupate, and become adults they most likely will migrate to sorghum to feed on developing kernels (between flowering and soft dough), and soybeans where they will feed on developing beans within the pods. Wheat aphids have really started showing up in wheat fields throughout north central Kansas. 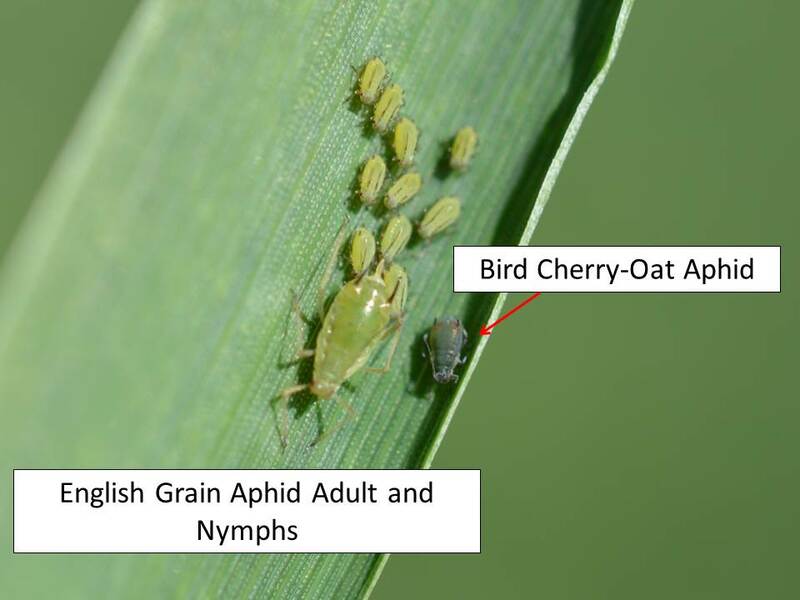 English grain and bird cherry-oat aphids are the two most commonly observed so far. These aphids usually do not build up in sufficient populations to stress wheat or impact yield, especially when growing conditions are good, which they have been for the last couple of weeks. These aphids can vector barley yellow dwarf virus, however at this time of year this should not impact yield. 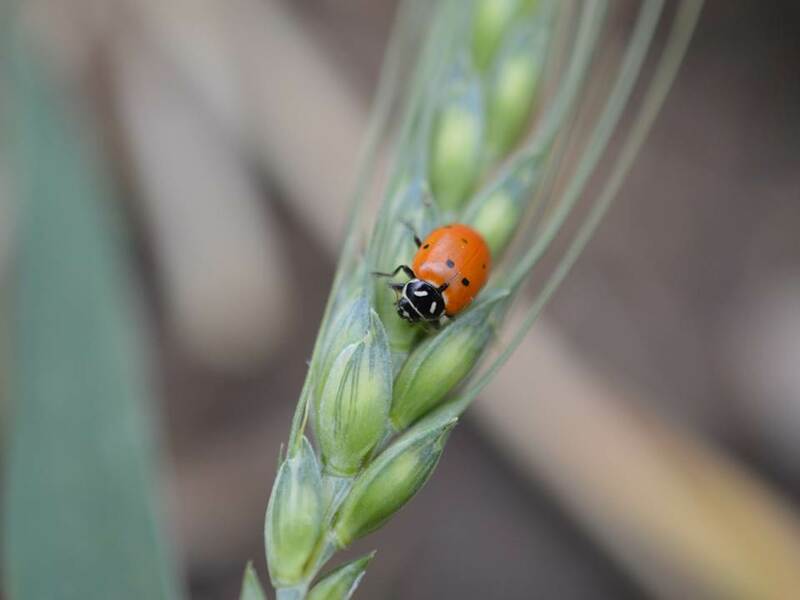 These aphids are providing a plentiful food source for lady beetles, and all wheat fields sampled in the last seven days contained significant numbers of lady beetles. Therefore, it is prudent not to spray for these wheat aphids unless there are 20+/tiller on a field-wide basis. Especially do not include an insecticide in a mixture with a fungicide “just in case”. 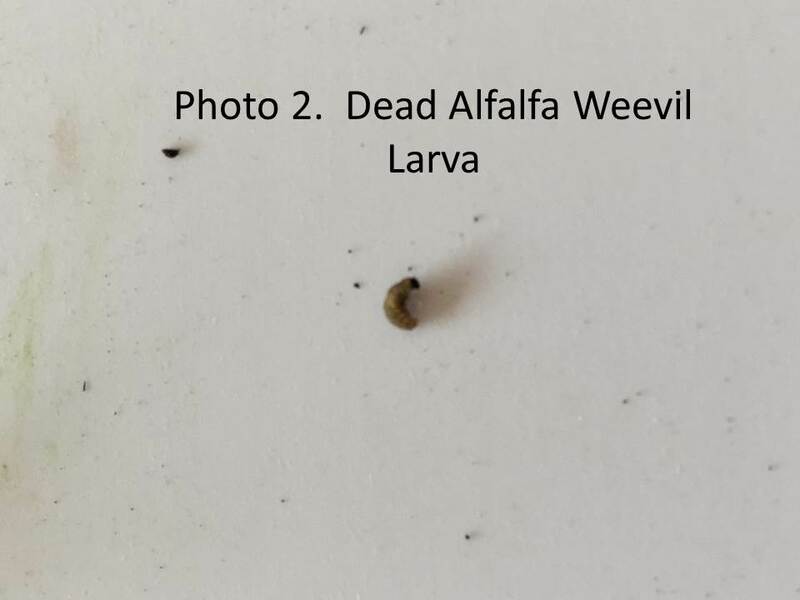 Alfalfa weevil larvae have been hatching throughout north central and south central Kansas for the last couple of weeks. However, as of 9 March, there doesn’t seem to be much feeding or development yet (Photo1). 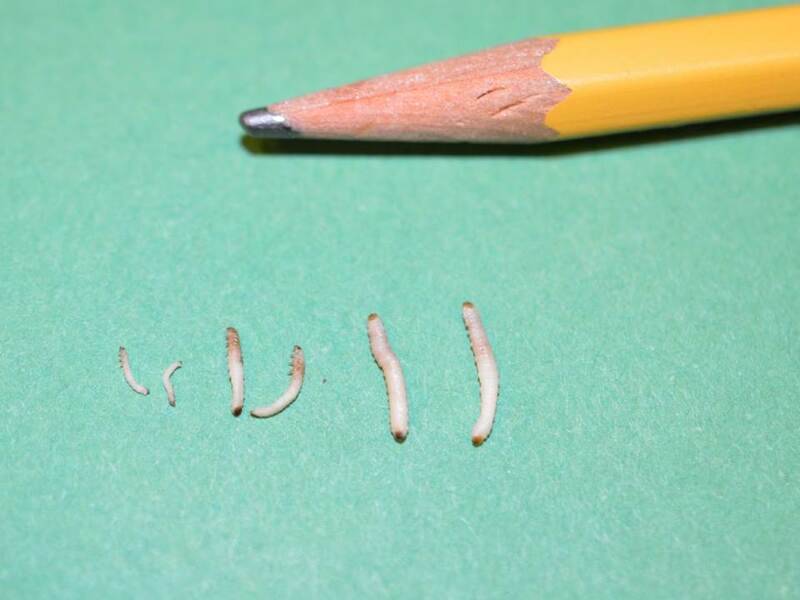 There are also a few of these tiny larvae that are dead (Photo2). Because these larvae are so small and vulnerable it is difficult to determine the cause of death. At least some of the mortality could be related to weather fluctuations that have reached mid 70’s for several days but also dropping into the mid to low 20’s some nights. 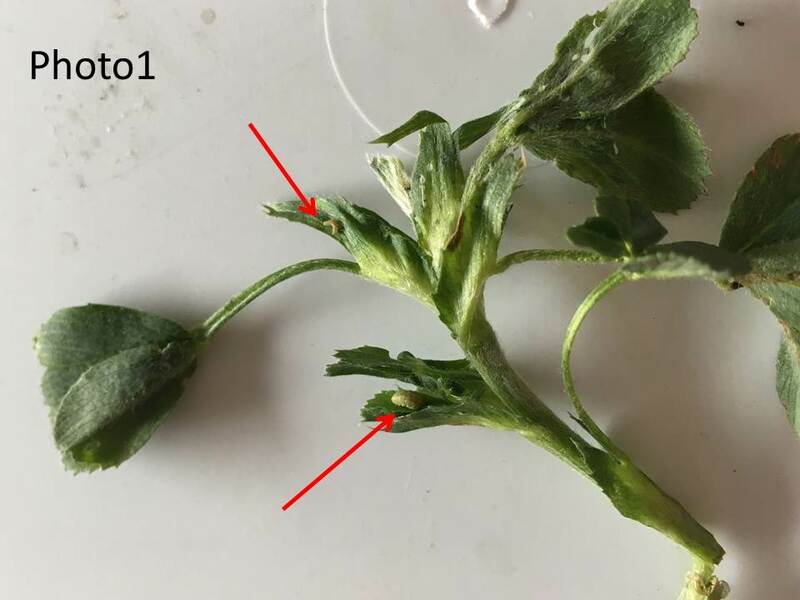 Most of these larvae are so small that they are well enclosed within the plant terminals to the point that they cannot be dislodged by shaking the stems into a bucket, as the most accurate sampling method specifies. This can definitely cause you to underestimate larval populations. Probably the easiest solution is to hold off sampling until the middle of next week, if the weather turns cooler as predicted. 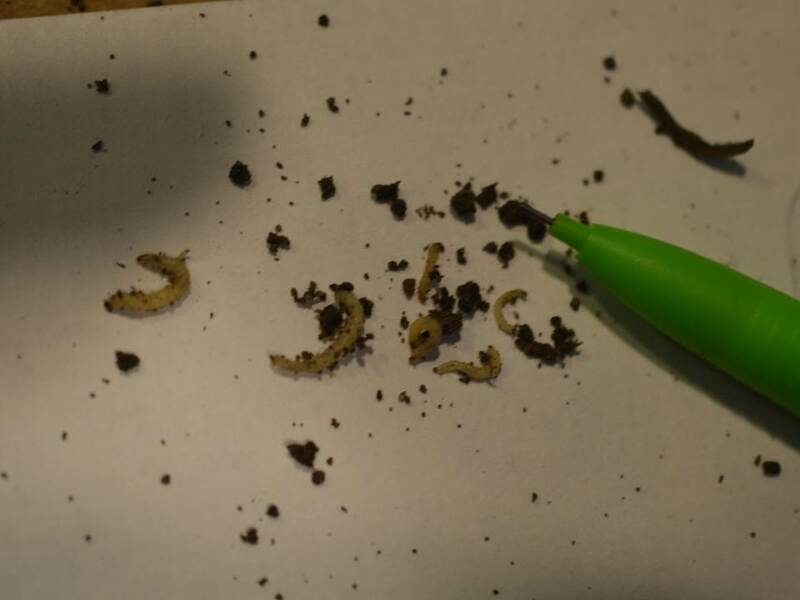 There are a few more mature larvae present, along with adult weevils (Photos 3, 4). Adults will probably continue depositing eggs for a few more weeks, thus extending the period of larval hatching. There are also a few pea aphids present. Populations do not seem to be increasing now, and there are lady beetles and parasitoid wasps actively attacking these aphids. Also, reports of cowpea aphids in south central Kansas bear watching. These aphids are usually more numerous in warmer summer months. They can add stress to plants by feeding, but they also produce copious quantities of honeydew which can become covered with sooty mold. 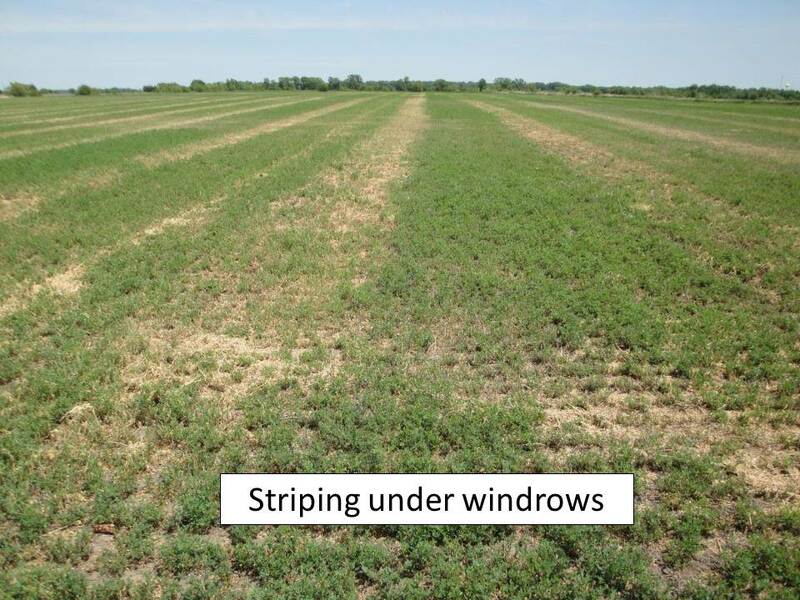 This may further stress alfalfa by interfering with photosynthesis, especially with small plants coming out of winter dormancy and experiencing dry conditions and fluctuating temperatures. 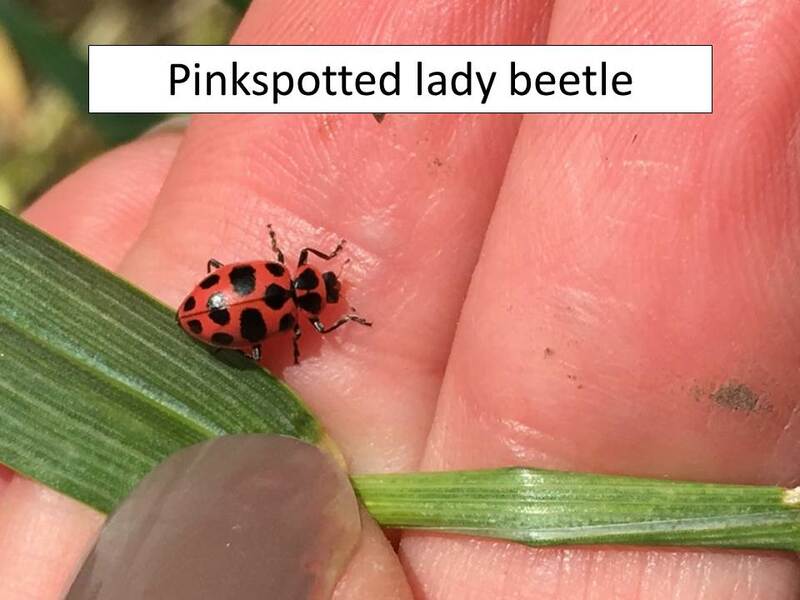 Lady beetles are unusually common in corn fields right now. Most corn plants in north central Kanas are from V2-V6. Checking corn rootworm plots revealed western corn rootworm larvae of various sizes and thus they are starting to feed enough to cause a little root damage. Seems like, despite the recent cooler, wetter conditions, the rootworm development is about where it usually is at this time. 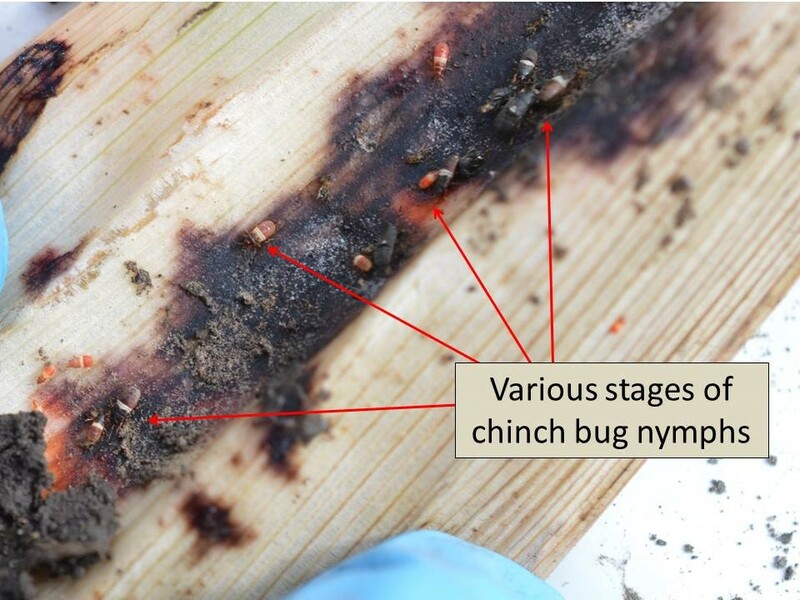 Most western corn rootworms have completed the larval stage by the 1st of July, thus root damage will be completed later this month as the larvae begin to pupate in south central and north central Kansas. 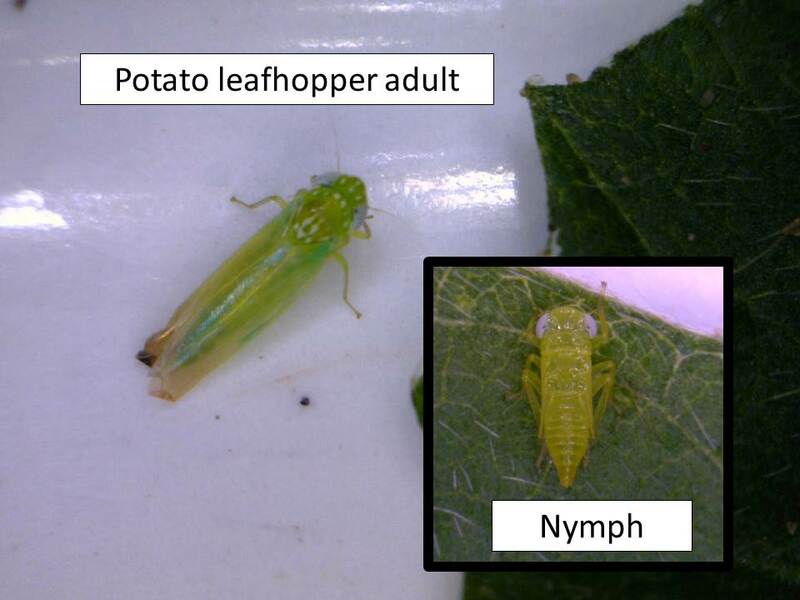 Potato leafhoppers continue to inhabit every alfalfa field sampled in north central Kansas. Populations are still mostly composed of adults but a few nymphs are emerging. These potato leafhoppers have few natural enemies and thus populations will just continue to increase. 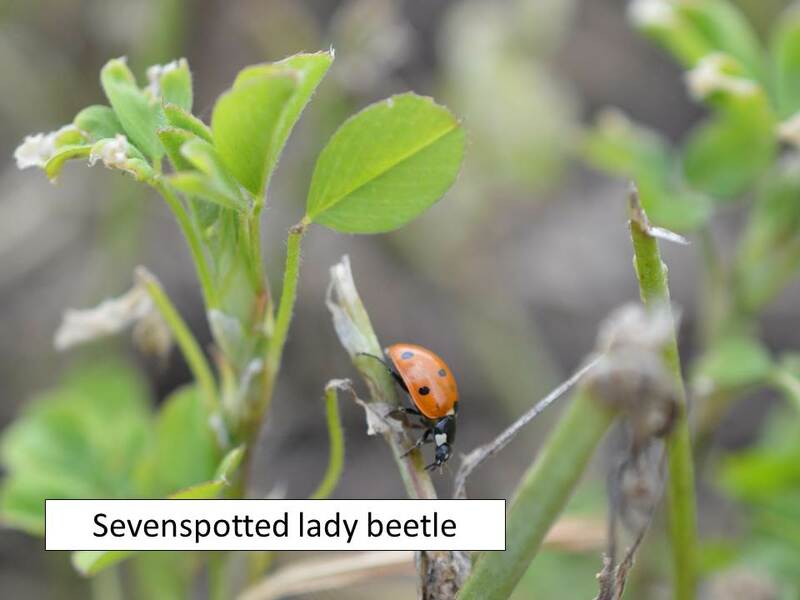 There are still relatively plentiful numbers of lady beetles and green lacewings in most alfalfa fields, and while they probably won’t help with potato leafhoppers, they should continue to help control any developing aphid populations. 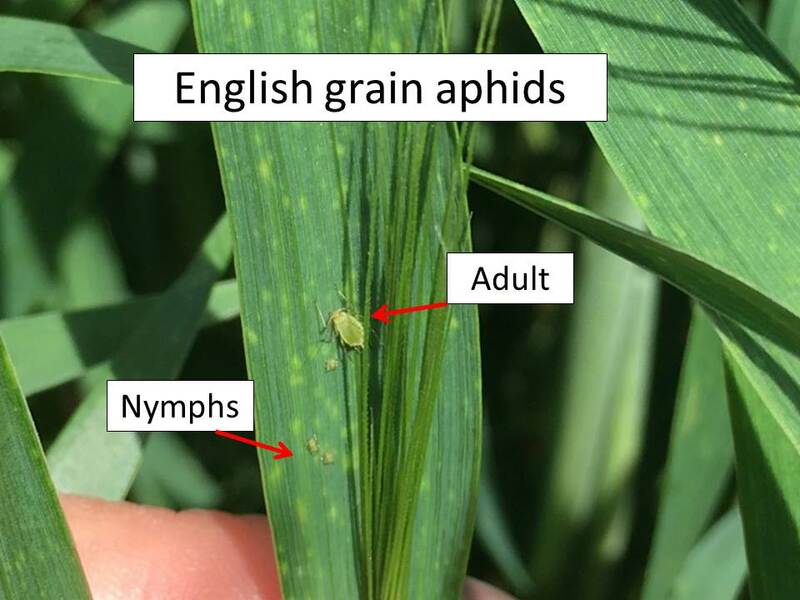 Aphid populations remain at minimal levels in all wheat fields monitored throughout northcentral Kansas. 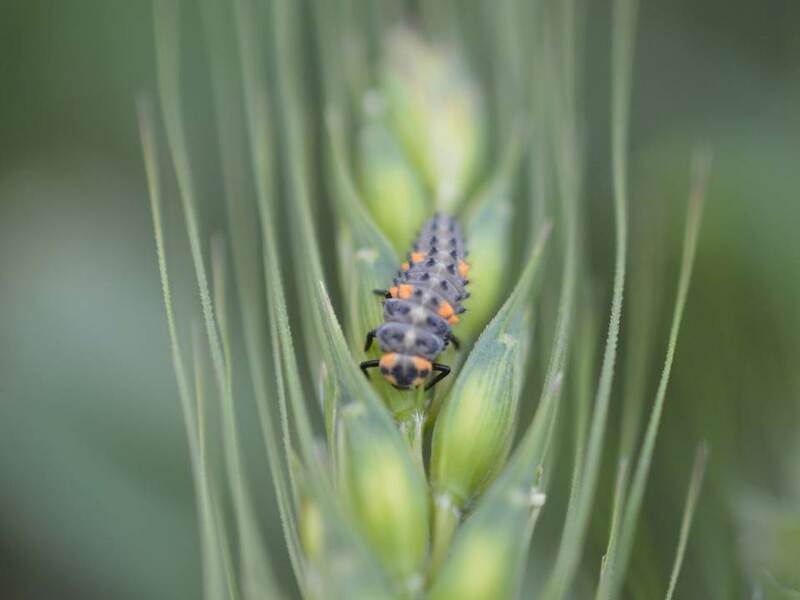 Lady beetle and green lacewing populations are still present in these wheat fields and therefore should prevent any aphid increases. Much of the alfalfa in northcentral Kansas that could be swathed has been in the last week. 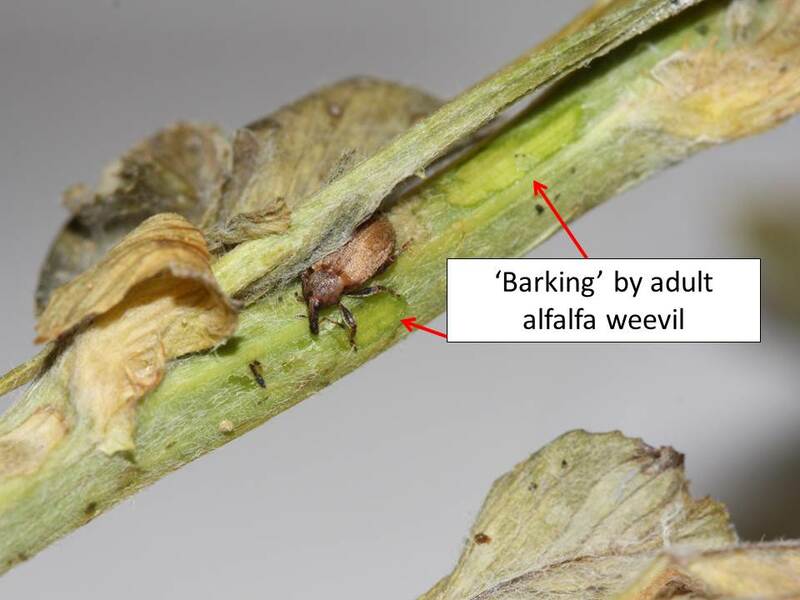 The cool damp weather has kept the adult alfalfa weevils in the fields. They are congregated under windrows in the cut fields where they do a little feeding on the stems, resulting in characteristic spots of epidermis removal, called ‘barking’. As these windrows are picked up there will be the characteristic striping across the fields where the windrows held back the regrowth underneath, plus provided the weevils with a protected site to continue feeding. Fields not yet swathed also have significant populations of adults but this should not impact the foliage prior to cutting. 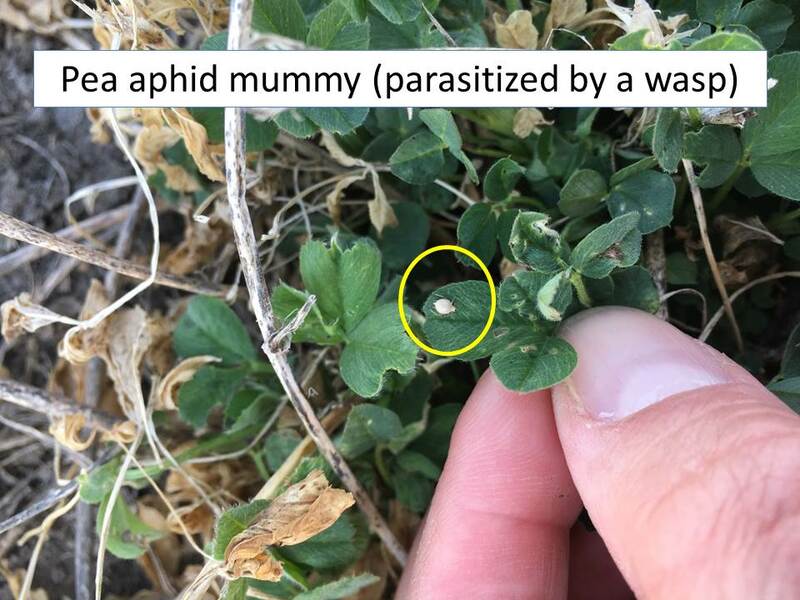 Pea aphids are also present in both cut and uncut fields, but lady beetles and green lacewings are also, so would not expect pea aphid populations to have a negative impact on alfalfa. 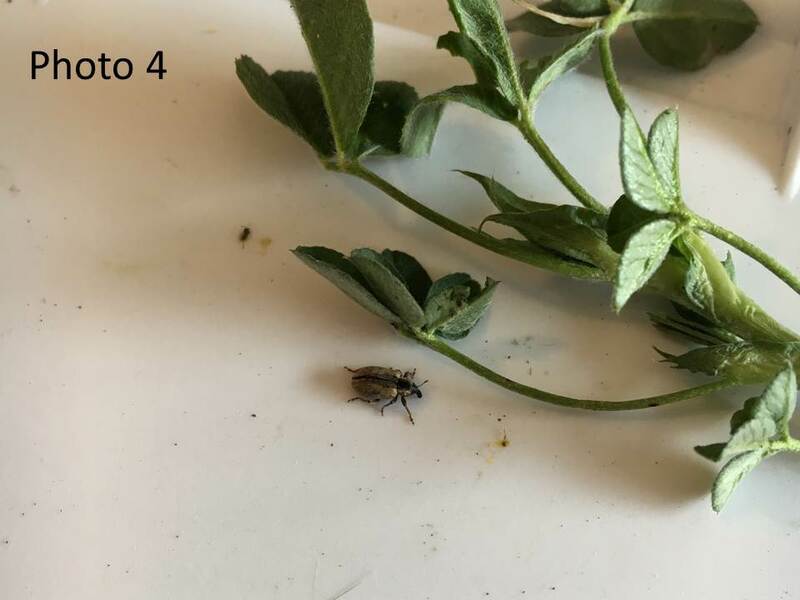 Potato leafhopper adults are already present in all alfalfa fields we checked over the past week. This is earlier than usual for these pests as they typically don’t migrate into the state for another month, between the 2nd and 3rd cutting. Some of these populations already exceed the treatment threshold with just adults, so hatching nymphs will just increase the populations further. These potato leafhopper populations need to be monitored throughout the rest of the growing season. 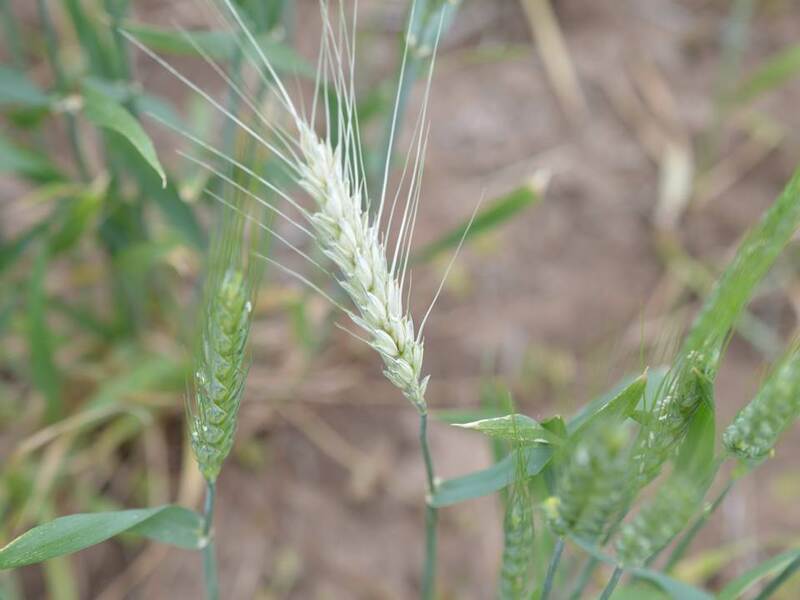 Wheat fields sampled in NC Kansas over the last week have diminishing populations of aphids. Many fields had to be sampled relatively vigorously to find any aphids. 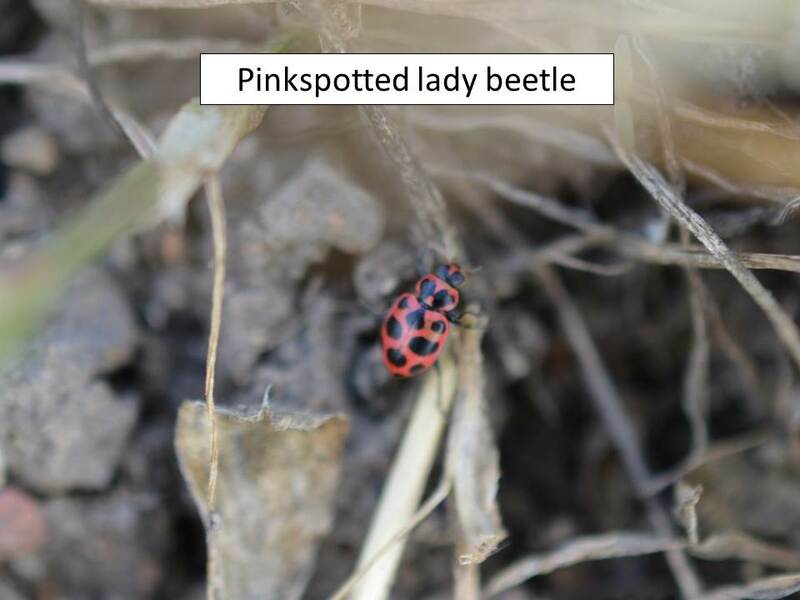 However, lady beetles are still quite plentiful which should bode well for not allowing the aphid populations to rebound. Scattered white heads are starting to be easily distinguished in the green wheat. 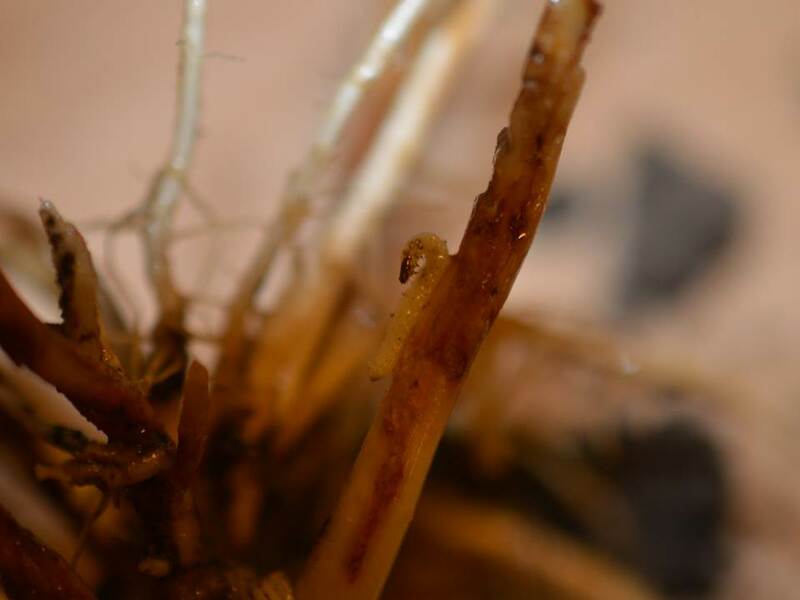 If the stem pulls out easily, with some apparent feeding in the stem, this is from the wheat stem maggot. 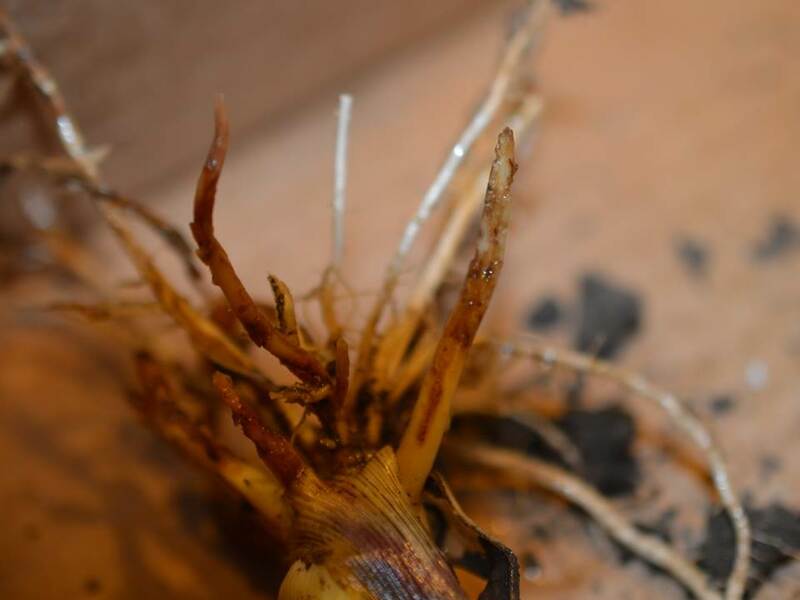 The number of infested stems in always negligible relative to yield loss but often causes concern because of the easily noticed white heads. Last week wheat aphid populations were active and had increased considerably from the previous couple of weeks in north central Kansas. 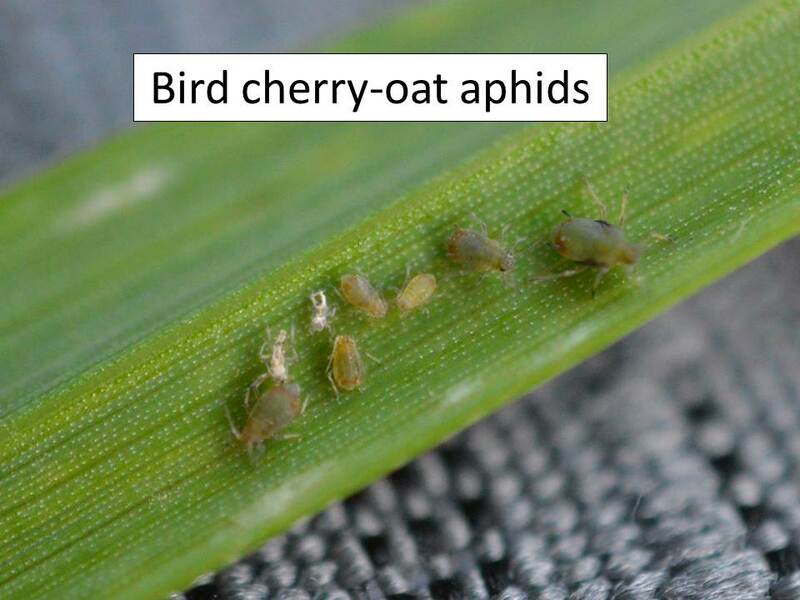 Populations of bird cherry-oat aphids, English grain aphids, and greenbugs were all reproducing and still migrating in. 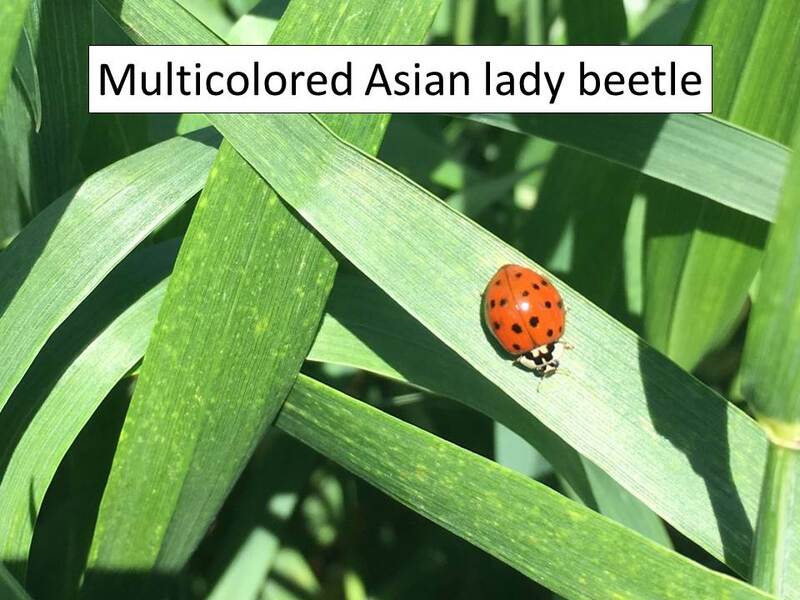 This week however, in fields we sampled in north central Kansas, the aphid populations had decreased drastically and the beneficials, especially lady beetles, had increased greatly. 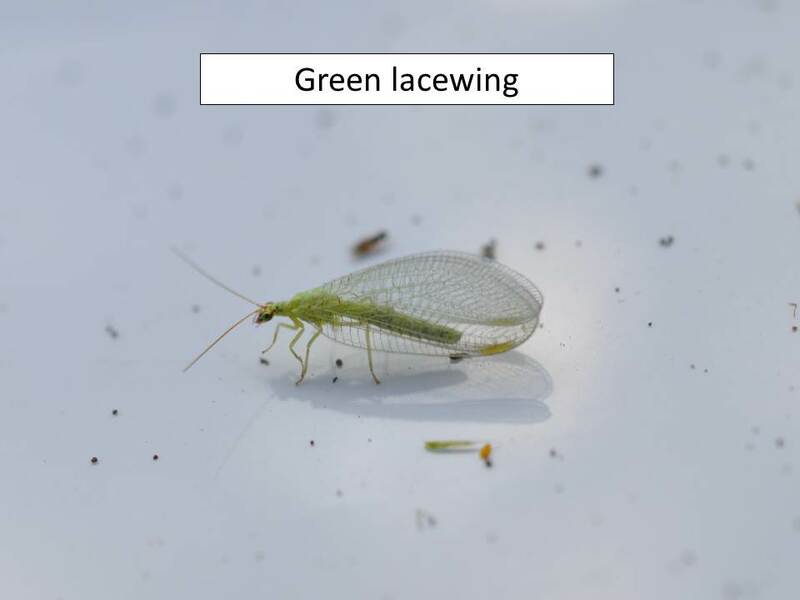 Last week these English grain aphids were inadvertently identified as greenbugs. Household Pests of Kansas is now available!